If you suffer from cracked, damaged, or stained teeth and would like to improve your smile, dental veneers may be the right choice for you. This popular treatment can restore both the appearance and function of your teeth. Here is a brief look at how you can improve your smile with dental veneers. Perhaps the most attractive advantage of dental veneers is their ability to blend in with your natural teeth. Your dentist can use this procedure to treat a number of conditions and return your smile to normal. While many choose dental veneers that discreetly fill in their smiles, others take advantage of the opportunity to brighten their teeth a few shades. Veneers are also resistant to staining from coffee, wine, and strongly colored berries. Many individuals are pleased with the fact that they can retain the majority of each natural tooth. Like any other dental treatment, the first step is to talk to your dentist and make sure that this procedure is right for you. Your dentist will remove a small portion of your enamel so that the veneer has room to fit over the tooth; in some cases, you may be eligible for veneers that require little to no removal of enamel . Your dentist can then bond the veneer to your tooth using a special resin that hardens in the presence of a curing light. Maintaining your dental veneers is important if you want them to last for years to come. You can do this by simply practicing proper dental hygiene; brush your teeth twice each day, floss every day, and be sure to keep your dentist appointments. Talk to your dentist if you have a habit of grinding your teeth. Are you interested in improving your smile with dental veneers? Contact Park 56 Dental or visit our website. Our team features some of the best dentists in New York, and we are happy to provide high quality dental bridges and root canal treatments in addition to dental veneers in NYC. Give us a call at (646) 783-3529 for more information about our services. Brushing and flossing your teeth every day, eating properly, and seeing your dentist on a regular basis are essential aspects of oral health. Even the best dentist in New York , however, cannot force you to eat properly. Read on to find out what you should be snacking on for healthier teeth. Sweet snacks that are loaded with sugar can be dangerous to your oral health. As delicious as they may be, it is important not to overindulge. Choose a balanced diet instead. Be sure to include plenty of fruits and vegetables as well as whole grains and low-fat dairy. 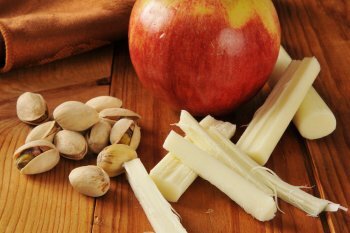 If you are going to snack in between meals, make the healthy choice and snack on an apple or a cheese stick. Water is helpful for countless reasons; one of them is its ability to flush sugar and food debris from your mouth. Remember that an important aspect of dental health is visiting the best dentist in New York at Park 56 Dental. Please do not hesitate to visit our website or call us at (646) 783-3529 to learn about our sedation dentistry, dental implants, and root canals in NYC. If you live in the area, stop by our offices today.